GoDaddy Email Marketing uses something called Markdown, to format text. But there's a button you can use, to make your text bold. Add a module with a text block, or click inside an existing text block. 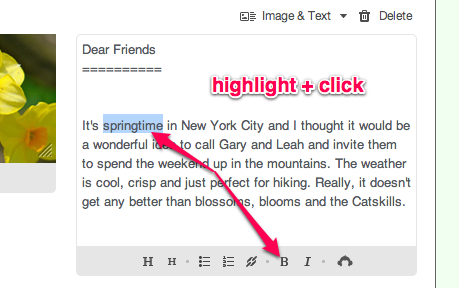 Highlight the text you want to make bold. Click the B at the bottom of your text module. Two asterisks will appear on each side of your text. This means the text will be bold, when you preview it. 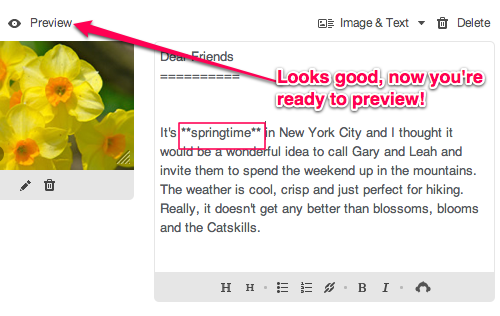 Click Preview at the top of the module, to show the bold text. Click Save at the top or bottom of the page. When the rest of your campaign looks good, send the email to your subscribers.